One of my best friends brought Rex a bib emblazoned with “foodie in training” ~ and I can safely say with Ross and I as his mum and dad Rex is just that!! This post is hopefully going to be an informative one, for any new mummys who are confused about what and how to encourage baby to try some food, other than milk 😊. This is all from mine and Rexy Roos experience over the last month…..
Our approach to parenting with Rex has been gentle and natural, and this is even more so when it comes to him eating. One of my great hopes is that Rex grows into a happy, healthy, gentle giant who can recognise nourishing, nutritious food and enjoy it. 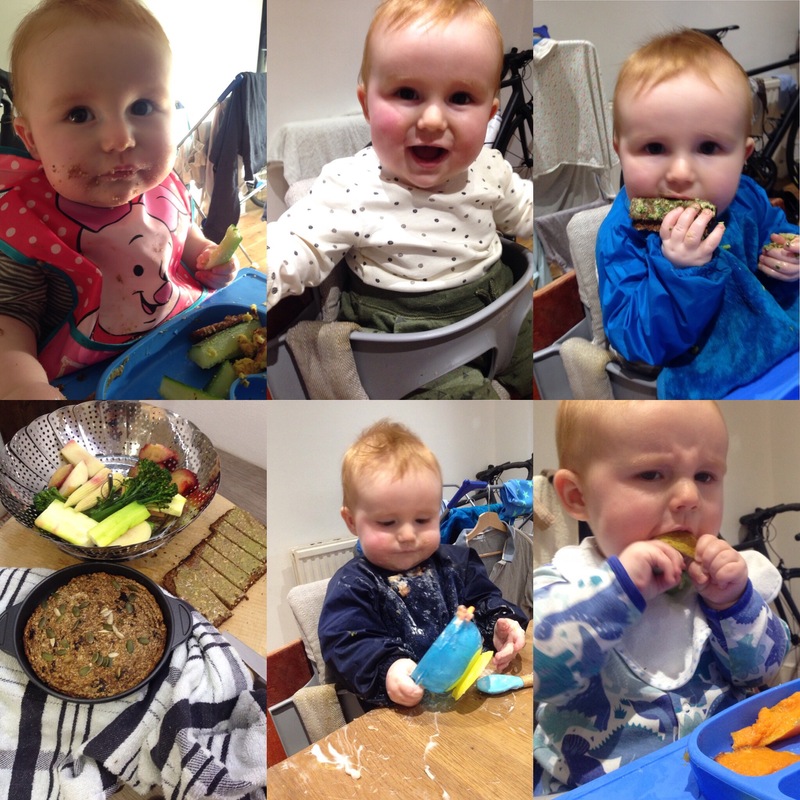 For these reasons we decided a baby led path to eating was right for us and Rex. 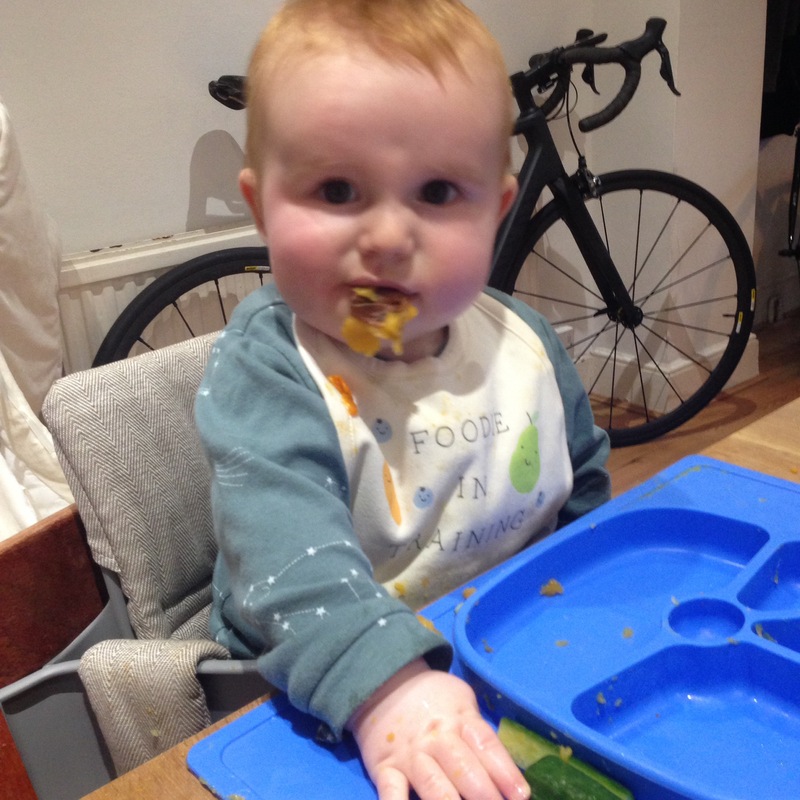 Baby led weaning makes introducing solid food easier and more enjoyable for the whole family and encourages baby to become confident and happy at mealtime so. There is no need for purée or spoon feeding. For his first 6 months of life I was lucky enough to be able to breastfeed Rex exclusively. This was something hugely important to me as there are so many benefits to breastfeeding. It was the right thing for us. Alongside this I started giving Rex spring onions to chew on when the teething began as well as a remedy for constipation caused by teething (the amount of dribble teething some times causes means that babies are often left constipated with not enough moisture to create and help Poo! ), both on the advice of Rexys Auntie Vera, who really has been a true guiding light to us.. This remedy is made as follows: soak 2TBSP organic basmati rice in 4 fluid ounces of boiled, cooled water overnight. Then drain away the rice and add 8 drops of lemon juice. I gave this to Rex on a little spoon. He also had a few crudités of cold cucumber and carrot from time to time to help ease the pain. It was important for me to wait offering him food properly until he was 6 months as this time allowed his little digestive system the chance to mature, offered him greater protection from illness through the development of immune factors and beneficial gut bacteria, plus it meant he was developmentally ready: he was almost sitting up by himself, able to support his head, was able to grab things and had started the big baby exploration tactic of putting EVERYTHING he could lay his hands on into his mouth. The day Rex turned 6 months old he was RARING TO GO! And so go go go we did! As I mentioned above, we felt baby led “weaning” was right for Rex. It is actually completely natural for breastfed babies to go with the flow and feed themselves as, don’t forget, they have spent so far their entire lives deciding when they need milk and how much they need! I also liked the fact it would mean Rex could learn to feed himself, handle food of a variety of textures and really get to grips with as many foods in their whole, natural state as possible. I have avoided pre packed baby foods as so many of them are full of crap, mainly sugar. I find this so upsetting!!! Why do manufacturers feel a main ingredient, or ANY ingredient in a baby food should be sugar?!?!?! 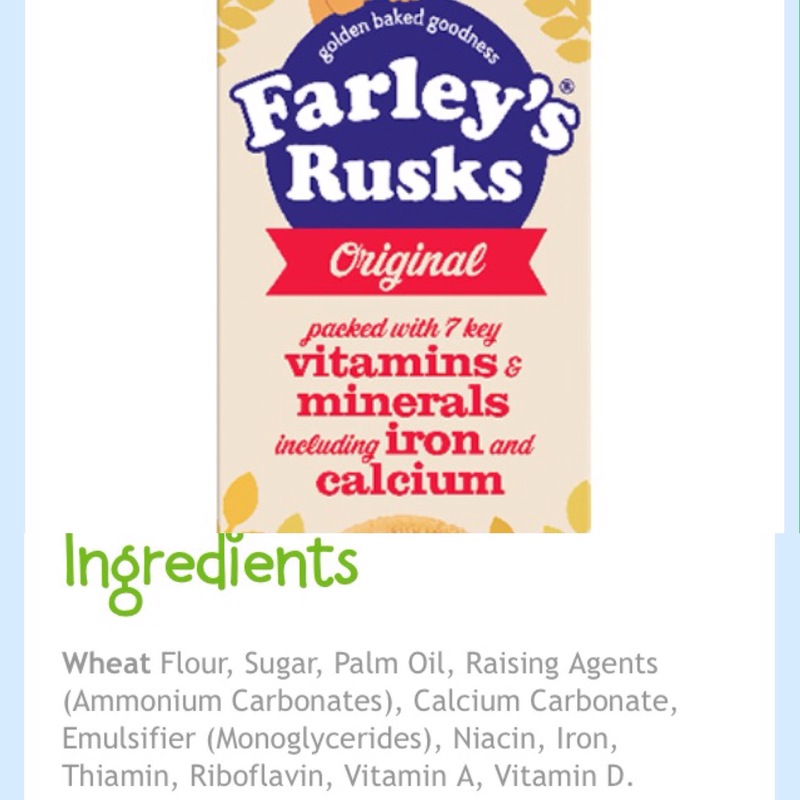 Farley’s Rusks, for example, describe on their packaging that they are packed with “7 key vitamins and minerals , including iron and calcium”, and then go onto list their “baby-grade ingredients”, the second of which is SUGAR. HOW on earth can sugar be baby grade? this only really again highlights how important it is to always read the labels, as I re-leant recently on my own refined sugar-free week. and furthermore, it takes practically no time to create something for Rex to eat, and is probably cheaper than buying pre made stuff. Baked porridge breakfast biscuits: simply mash 1 banana into 4-5 tablespoons of oats and then add your extras of fruit, nut & spices. We have tried all of the following and they all work very well: grated Apple, grated carrot, chopped prunes, raisins, chopped dates, berries, coconut flour, desicated coconut, chia seeds, quinoa flakes, ground almonds, pumpkin seeds, sunflower seeds, cinnamon, nutmeg, cloves. Stir your extras in then press the mixture into the base of a cooking dish or spoon into individual cookie shapes and bake for 10-15 mins. Coconut yogurt for dessert- this is full of good probiotics and ensures Rexy Roos digestion remains smooth. This is also a great opportunity for him to practice with some spoons!